Marshall J. Brown offers simplex basket strainers in a wide assortment of sizes and materials. We have proudly served our clients with expert knowledge and quality products since 1952, and we will gladly extend our professionalism to you. 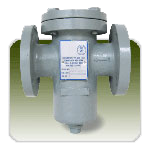 Simplex strainers, also referred to as single basket strainers, are used as an effective method in protecting pipeline systems and equipment. Let Marshall J Brown supply your simplex basket strainers. Contact us today for a quote or for additional questions.